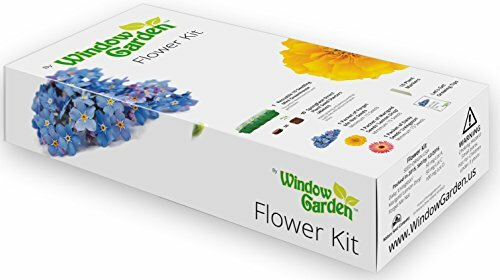 Window Garden Flower Growing Kit Is an Easy to Grow Flower Seed Kit, Includes a 10 Cavity Mini Greenhouse, Spongease Seed Starters and 3 Varieties of Flower Seeds. Great Flower Seed Gift. MINI GREENHOUSE - High Quality and Reusable, Creates the Perfect Environment for Flower Seeds to Germinate. EVERYTHING YOU NEED - Our Flower Growing Kit is Complete, Fascinating and Rewarding for All Ages. EASY TO GROW FLOWER SEED KIT - Fits on Any Window Sill or Fits Great on a Window Garden Veg Ledge. FLOWER SEED GIFT FOR ANY OCCASION - Christmas, Birthdays, Moms, Dads, Students, Friends - Impressive From the Packaging to the Detailed Instructions - Sure to WOW! Easy to grow flower seed kit complete with 3 Varieties of Flower Seeds. The Window Garden Flower Growing Kit is, easy, convenient and designed for success for any skill level. DonÕt buy expensive plants at the nursery, grow them by seed and save! Great for all ages, get kids involved in growing colorful flowers. Easy to follow and informative growing instructions with quality components make it easy to start your garden by seed. No need to buy different products like seeds or messy growing medium. When your seedlings are grown, just plant them directly into a planter or in your garden. Mini Greenhouse - Seed needs constant moisture to germinate, the sealed lid and clear top ensures moisture and success. Impressive Flower Grow Kit with premium packaging, graphics and instructions make it a great flower seed gift for anyone or any occasion. 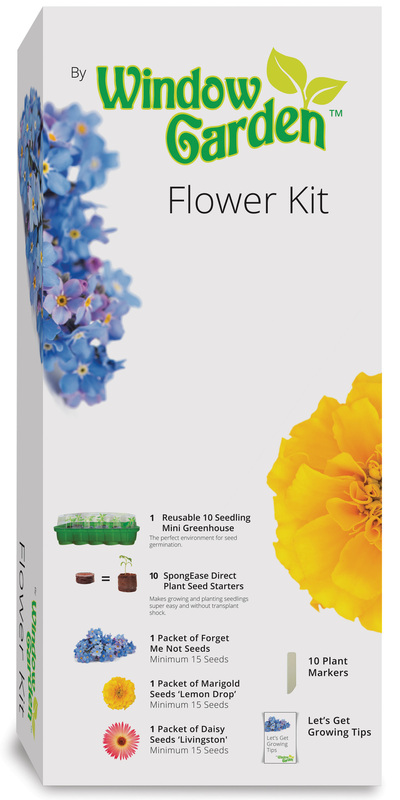 Contains: 1 Ten Cavity Mini Greenhouse, 10 SpongEase Seed Starters, Forget Me Not, Marigold and Livingston Daisy seeds with complete instructions and growing information.